Well, I suppose I always knew it was going to come one day. My poor old PlayStation 2 (or "Twoey", as I liked to call him) breathed his last this past weekend. He had had problems with his health ever since we moved to Taiwan. I took him in a couple of times, we got him cleaned up and got a new laser for him, but I can see now that we were really just grasping at straws. He stopped reading even my games from home on Friday, I cleaned him over the weekend, but he starting coming back with "Disc Read Error"s, which we all know are the death-knell for a PS2. And I swear to honor his memory by getting one of those wonderful new Slimline PS2s as soon as is humanly possible. I mean, come on. Shin Megami Tensei: Nocturne and Beyond Good and Evil aren't going to play themselves. 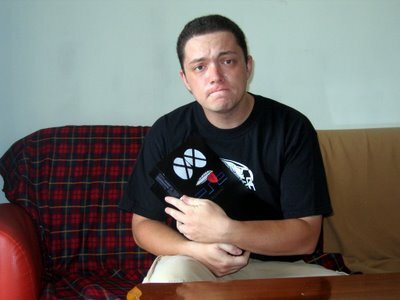 In lieu of flowers, the family has asked that donations be made in Twoey's name to the "Adam Hunt Desperately Needs a PS3 on Launch Day Fund." I'll post some pictures of us in happier times once I pull myself together a bit.